You probably never think about it, but at one time, it was rare for a bike to have anything but a level, horizontal top tube. In the early 90’s, sloping top tubes gradually found their way into the market and now they’re the norm. One good thing that’s come about as a result of sloping top tubes is that we no longer get as “hung up” about how much clearance the rider has over the top tube. 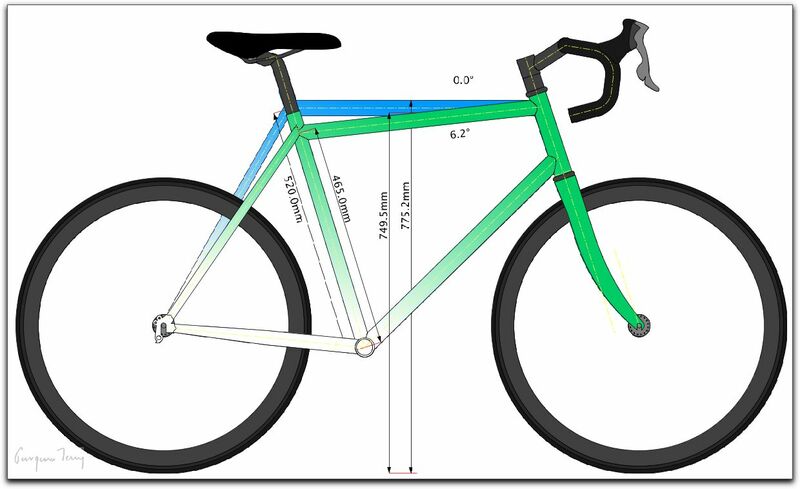 With horizontal top tubes, the rule of thumb is to have 1″ to about 2″ of clearance, depending on your riding style. It’s not uncommon for a rider to have 3+” of clearance over a sloping top tube. Here’s a drawing to help you visualize the effect of the two tope tube “styles”. Note that the two bikes interposed over each other are identical except for the sloping top tube and the shorter seat tube on the sloping model. The same cyclist could ride either bike and have the same fit on each of them. She will have more clearance over the sloping top tube and more of her seat post will be showing. Two bikes, one rider, same fit. From this drawing, you can see that, in terms of being able to clear the top tube, women with a wider range of inseams could “fit” this bike than one with a horizontal top tube. Indeed, when a bike has a horizontal top tube, the ability to clear it by a certain amount is critical. But with a sloping top tube, that parameter becomes blurred. Now the focus turns to the relative positions of the saddle and the handlebars. If a sloping top tube means more women can “fit” a certain size, does it necessarily follow that the front end of that bicycle is also a good fit? This is where worlds collide. If a rider with a shorter inseam finds the handlebars to be comfortable when set at the same level as her saddle, the taller rider may find the bars to be too low relative to her higher saddle height. No problem, you say — simply raise the bars. It’s not always that simple. With carbon fiber and aluminum steerer tubes in forks becoming the standard, there’s a limit to how tall the spacer “deck” below the stem can safely be. 30 – 35 mm is pretty much the limit. Contrast that to steel steerer tubes, where 50 – 60mm of spacers isn’t out of hand. 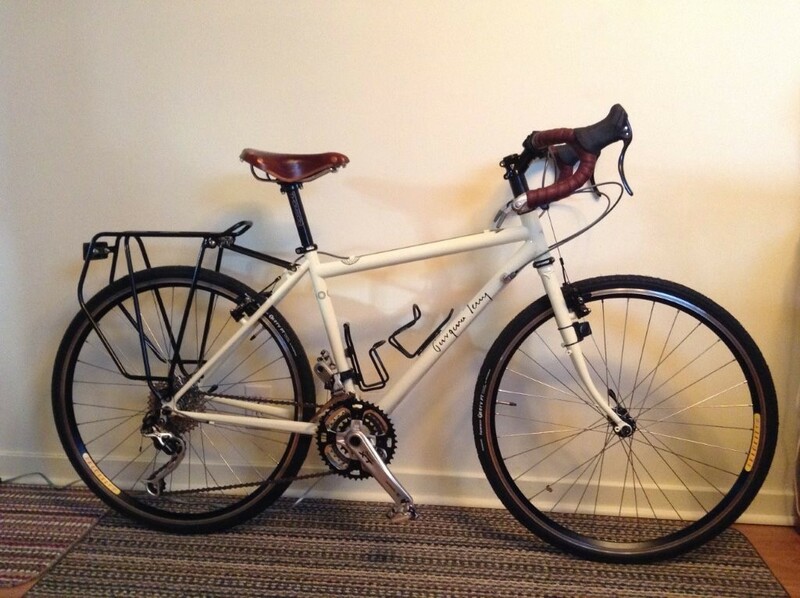 One “fix” is to make bikes with taller head tubes, which raises the handlebars. Since it is rarely the case that a rider considers her bars to be too high, this is a palatable solution. My guess is tall head tubes are in vogue because when sloping top tubes became the standard, we lost comfort at the front end and realized we had to get it back. What’s going on with the stem and handlebars is key to your comfort and efficiency. Unfortunately, it’s also an area that can be unyielding in terms of options. Stems do come in a variety of lengths and angles, but the option of raising the stem is often the deal breaker.